Review: iQi Mobile makes wireless charging a reality for iPhones, but is it worth the cost? The iQi Mobile is an insert that enables wireless charging for the iPhone. At it’s core, it is a crowdfunded hack. It doesn’t have MFi certification and it looks like a branded DIY project. This is never going to be a mass-market accessory. There’s no need to beat around the bush — this is a geeky toy for people drawn in by the idea of wireless charging. But is it any good? The iQi Mobile looks like a small matchbox-sized dog tag, with a Lightning connector on one end. The ribbon cable is bendy, but apparently it is a weak point. The accompanying warning notices clearly state that the cable will be damaged if it is bent completely 90° degrees. Another oddity is that one side of the Lightning cable has a weird bit of plastic on it. Although I don’t think the connector could damage the iPhone’s port in any meaningful way, I do get a bit wary when inserting it. To connect the accessory to your iPhone, you push the iQi Mobile connector firmly into the Lightning port. The first few times I didn’t push it in far enough, because I was concerned it would damage the phone itself. There’s no click to signify it is inserted so there is a bit of a ‘leap-of-faith’ moment here. Then, you bend the cable around the back of phone to leave the inductive panel flush with the back of the iPhone. The idea is that the panel is thin enough so that iPhones can still fit inside cases, thus concealing the fact the thing is attached at all. It fits into most soft cases and some tight-fitting cases. It fits in Apple’s iPhone 5s leather case snugly, my preferred case. When the phone is in the case, it’s practically invisible. The only way you can tell the iQi Mobile is attached is by looking closely at the Lightning port. Theoretically, you can now just leave the phone in the case and forget about it. Obviously, a big downside is that now you can’t use your iPhone’s Lightning port for anything else. If you use a dock regularly, this will be an annoyance. In terms of the charging aspect, it works fine. The phone needs to be aligned rather precisely with the pad for it to charge. The iQi pads beep to let you know if you need to adjust the positioning of the phone. Charging itself is adequate albeit slower than using a wall-socket. 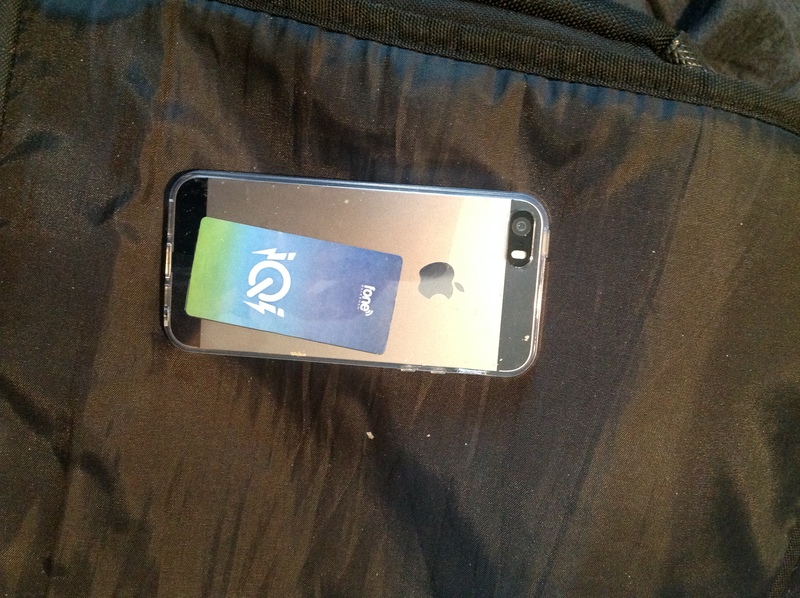 The iQi Mobile gets hot though, which is uncomfortable to the touch when you pick up your iPhone to leave. Overall, I would say the iQi Mobile does it job well. The price-to-convenience tradeoff, however, is what makes me hesitant to recommend this wholeheartedly. It’s just damn expensive for something that isn’t officially supported and might not even work with future iPhones. If you simply want to play around with something cool or already have other iQi compatible products, consider getting this but beware of the price. The iQi Mobile costs $35 by itself. Throw in the price of a charging pad and you are topping $80 for very small convenience benefits. It’s a cool factor more that anything else. In terms of practicality, plugging in a cable really isn’t that much effort, at the end of the day.